To bestow joy upon the least among us is to bestow joy upon the supreme goddess Óljamma herself. To inflict suffering upon the least among us is to inflict suffering upon her as well. For Óljamma possesses and shares all of consciousness, and she experiences all things. For soqjós, the descriptive ethics of the world is a pragmatic ethics, a kind of ethical evolution characterized by Theodore Parker and Martin Luther King Jr. as the arc of the moral universe — long, but it bends toward justice. Through such ethics, humanity has been struggling since the advent of civilization several thousand years ago to advance and rediscover the moral wisdom of our earlier, persistent, natural state. The meta-ethics of Perístanom, an exploration of how its ethical judgments can be supported and defended, in turn may be described as democratic ethics (or popular ethics), wherein the morality of a particular course of action (or inaction) is ultimately determined and justified by the collective judgment of those affected by that action (or inaction). It may be noticed that the emphasis here is on behavior rather than on belief. No one should ever be judged for that which she or he believes or does not believe, but rather for that which she or he does or does not do. Democratic ethics is superficially relative and yet fundamentally universal. In this way, it recognizes the existence of innate natural law, even as it acknowledges the potential legitimacy of local, human-made, positive law. Within any human domain (whether ethics, language, culture in general, psychology, or even physiology or anatomy), trivial differences exist among humans who are nevertheless fundamentally the same in their humanity. 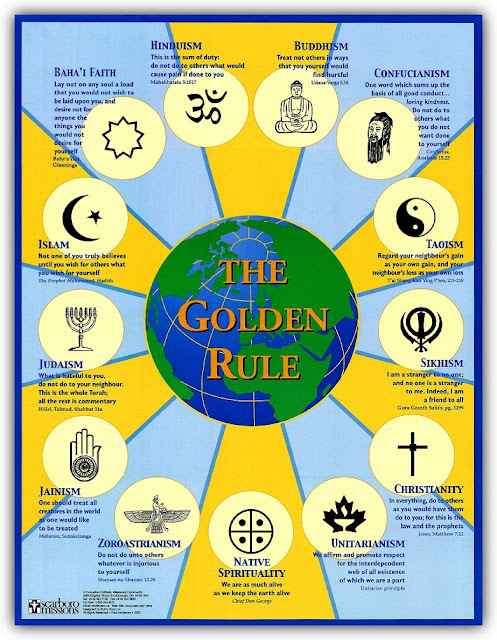 In terms of normative ethics and natural law, our common humanity allows Perístanom to justify adopting the fundamental moral principle of universality, more commonly known as the Golden Rule. People typically experience a sense of being endowed with free will, that they encounter meaningful choices in their lives and then actively decide among their options. In a way, this is similar to how early humans would have experienced the Earth as being stationary while the sun moved through the heavens from one horizon to another. The latter experience — of a geocentric universe — has been shown by modern scientific investigations to be inadequate for even a rudimentary understanding of celestial mechanics. Those willing to follow truth wherever is leads know that empirical findings need not always conform to our instincts or cherished beliefs. We can explore the physical basis for a belief in free will. To begin, the best explanatory models in contemporary physics are general relativity and quantum mechanics (including the standard model of particle physics). The former is a classical theory which is deterministic — that is, it holds that reality is entirely determined by precise physical laws. The latter theory, on the other hand, is characterized by irreducible uncertainty and random chance. Quantum mechanics itself, or rather the ways of understanding its implications, can be divided into categories. The two most prevalent of these various interpretations are the Copenhagen interpretation and the many-worlds interpretation. The former is complicated with ghost particles and collapsing wave-functions, which would seem to necessitate unprecedented and mysterious kinds of physical processes. Meanwhile, the latter avoids those complications by positing merely one additional spatial dimension of reality, wherein are arrayed a multitude of parallel universes, each slightly different from the next. This ‘multiverse’ includes and integrates within it every physically possible universe. That is, our most advanced theories in physics strongly suggest that any reality that could ever possibly exist, no matter how remote that possibility, actually does exist somewhere in the cosmos. Thus, it would seem that determinism and random chance are the two fundamental principles governing the unfolding of reality. These principles are by no means contradictory. Instead, they are complementary, each principle prevailing at a different level of reality. Random chance prevails within any one universe, but the multiverse as a whole is entirely deterministic. Peace may come to our lives when we appreciate that everything that happens, good and bad, here and elsewhere, is what is meant to happen, is what must happen somewhere. Unfortunately, this arrangement leaves no room for preserving free will. If, according to our best physical theories, every event in cosmic history is governed entirely by strict physical laws and random chance, applying as well to events involving human choice, then there is little physical basis for a belief in any meaningful free will — at least without the addition of a new, heretofore mysterious, and seemingly extraneous physical theory. This is not to say that free will absolutely does not exist, but merely that there is no rational basis for believing in its reality. Beyond this purely physical critique of free will, biologists provide their own insights. Our behavior and personality, it seems, are determined by the complex interactions between our individual genetic endowment and our formative experiences. This in itself does not preclude individual change, but it does suggest that even such change is itself more or less determined by our genes and our environment. We may assure ourselves that had we been subjected to the same formative stresses and provocations experienced by some criminal, we would have chosen differently, morally. However, even within a more conventional conception of choice, we cannot choose our genetic endowment and predispositions. Given the same nurture and the same nature, we would all make precisely the same moral choices. What are the implications of humans evidently having no truly free will? We can still speak of our making decisions, but those decisions, whatever they may be, are in a real sense predestined, at best affected at a local level only randomly. Moral transgressions may still elicit guilt, shame, regret, and remorse from some, and anger from others, but we have the option of seeing also the deeper truth that our “choices” and our behaviors are determined solely by our genetic disposition (nature) and our lived experience (nurture). Our choices are not separable from reality; they are apparent only. Everything that we do is the inescapable result of blind physical laws and random chance. Traditional religions have evoked this fundamental insight with such symbols as Indra’s Net, and God’s Plan, but the idea is much the same. Judgment should be left to the gods; ours is but to love one another. Every major faith tradition in the world — from the Buddhist Pratītyasamutpāda to the Christian Sermon on the Mount — teaches oneness, compassion, and mercy. We may yet choose to imprison a criminal — if “choose” is the correct word — not properly out of revenge or punishment, but rather with humility and compassion and to protect the community. No punishment is required. In Jungian terms, a drive to punish wrongdoers often involves the projection of our own psychological shadow onto others, external to ourselves, where our own forbidden and frustrated impulses may be safely repudiated. Evidence suggests that many criminals have already been abused or neglected in their youth — that is, essentially punished before ever committing their crimes. Even if not, how can we morally justify exacting revenge upon someone whose every action has been governed by immutable laws and random chance? This deeper perspective also validates the particular teaching — common to many religions — of trust in, and surrender to, the divine. Every possible universe, every possible action we might take, every thought we might think, every emotion we might feel, are absolutely and immediately real, are actually happening somewhere in the multiverse. Reality as a whole is foreordained, integrated, interconnected, crystalline. Our inexorable motion through time — through spacetime — is an illusion, an artifact constructed by the mind at every moment, a consequence of growing entropy and the second law of thermodynamics. Our ego may wish to exercise complete control over our lives, may fight for such control, may even believe itself to be at times and to degrees in control, although such local control is always illusory and a conceit. In truth, the gods — wiser beings than we — maintain exquisite global control across all of existence. Many have found comfort, grace, and wisdom in that realization. The key to forgiveness, of others and of ourselves, is the understanding that we are all playing our individual, impassioned roles within a great drama written by the gods. As Jaques observes in William Shakespeare’s As You Like It, ‘All the world’s a stage, / And all the men and women merely players...’. Óljamma, the sleeping goddess whose dream is the cosmos, is the source of all consciousness. We each experience in our lives typically only an infinitesimal portion of her eternal consciousness, as do all sentient beings everywhere within those universes wherein the gods evolve. Alone, our individual political opinions are more or less biased by our limited perspectives, senses, and experiences. Together, however, we see further and more broadly, with an aggregate knowledge closer to the omniscience of the gods and of transcendent Óljamma herself. The surest path for us to better express the meaning and intentions of Óljamma in the world is to pool our individual experiences of consciousness into a community. This is the essence of democracy — those significantly affected by any particular decision should make that decision. 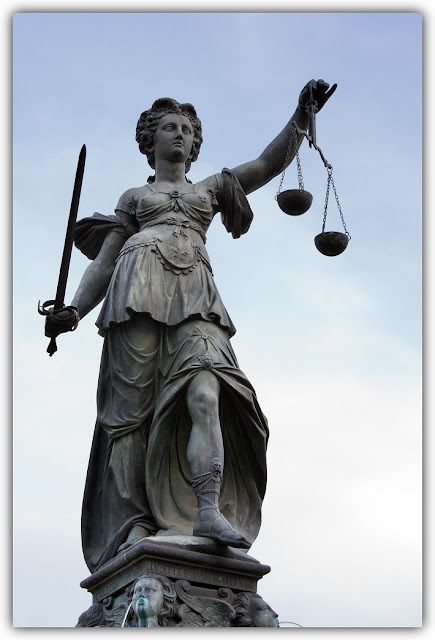 This is also a safeguard for justice. Some people claim that democracy amounts to a tyranny of the majority. They may conjure images of mob rule, as though a self-selected mob were to be regarded as somehow representative of a larger polity. Or they may cite historical examples of enslavement, war, and genocide popularly chosen by an elite citizenry, as though the enslaved or annihilated people themselves had ever been consulted on the matter affecting their lives. Opponents of democracy may object that it fails to guarantee the best decision — which begs the question: the best decision according to whom? And by whose criteria? Politics involves decisions based ultimately upon irreducibly subjective values. No more definitive method exists for determining the ‘best’ decision than democracy. To be charitable, the assertion that the majority can behave tyrannically may be true as far as it goes, but it willfully ignores a more fundamental truth. However made, any decision (or indecision) affecting a group is political and will unavoidably involve curtailing some freedom. Imposition is inevitable in any nonunanimous decision. For example, the enforcement of a stop sign at a busy roadway intersection imposes the tyranny of impeding free movement, but it also reduces the tyranny of impeding safe movement. The question then becomes: Which tyranny is worse — imposing on any journey additional seconds of time, or additional risks of injury or death? (Or stated alternatively: Which conflicting freedom is more important — movement or safety?) 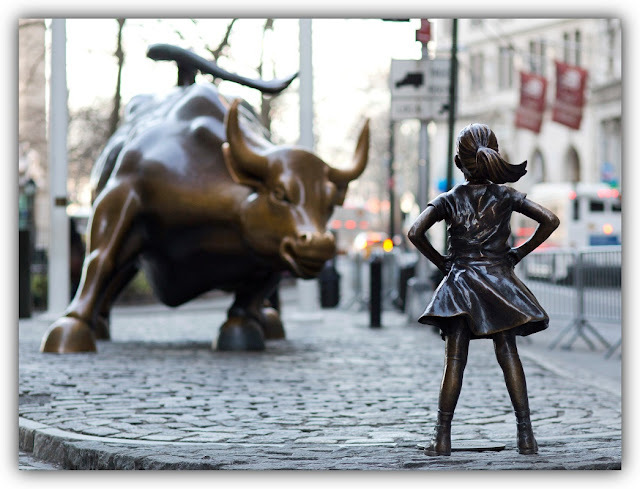 Weighing those mutually exclusive options, a choice must be made among competing subjective values. A majority decision by those affected by the decision ensures the least amount of tyranny for the greatest number of people. No, a democracy is two normal people and a misanthropic fabulist voting to share everything more or less equitably. The proper way for any group of individuals to make decisions concerning them all — be it family, community, society, or the entire world — is democratically, through free expression and free participation in a functioning democratic order. This means that consensus is built where practical, through deliberation both formal and informal, and, where impractical, the judgment of the majority of stakeholders determines the policy in question. Information upon which decisions are based, and the execution of those decisions, may be delegated to dedicated (and democratically operated) institutions and agencies. However, direct democracy is otherwise to obtain within the political sphere, the economic sphere, the corporate sphere, the ecclesiastical sphere, within any institution large or small, public or private, and within any other domain wherein decisions affecting the group can be made. The majority opinion is to be regarded as sacred, as the closest we mortals can reliably come to embodying divine intentions. This philosophical position may best be termed democratic ethics. 1. Diversion of most military expenditures to immediate public investment in renewable energy. 2. Closure of all foreign military bases. 3. Universal basic income sufficient to meet all needs for decent survival (e.g. improved Social-Security-for-All). 4. Universal single-payer healthcare (e.g. improved Medicare-for-All). 5. Publicly funded higher education available to anyone. 6. Publicly funded elections at all levels. 7. Restoration of division between commercial banking and investment banking (i.e. Glass-Steagall). 8. Elimination of spurious rights to intellectual property (i.e. eliminating artificial scarcity). 9. Release of all non-violent offenders from federal and state penitentiaries, with savings used in treatment of substance abuse. 10. Income tax, capital gains tax, estate tax, and corporate tax on rich and their investments, to finance social programs. 11. Tariffs imposed on businesses opposing or avoiding these solutions or similar solutions in other countries. 12. Elimination of veto power of permanent members of United Nations Security Council. 13. Recognition of primary authority of Statute of International Court of Justice. 14. Creation of national high-speed-rail transportation, beginning along Atlantic and Pacific coasts and expanding nationally. 15. Workplace democracy mandated within all business enterprises, large and small. 16. Reorganization of all commercial enterprises as worker cooperatives, with outside funding solely from credit unions. Doubters may claim the above proposals could never work, although we might expect an identical reaction were we to describe the United States to someone unfamiliar with its current economic order. Or they may claim insufficient money exists to finance such ambitious social programs. They vastly underestimate the staggering levels of privately held wealth in American society. 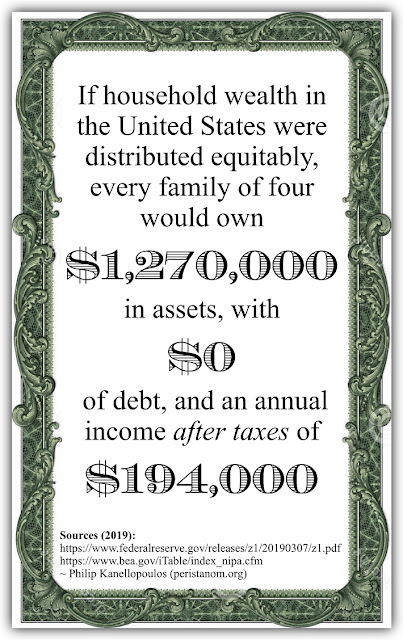 If household wealth and income created by working people in the United States were distributed equitably, every family of four would own $1,270,000 in assets, with $0 of debt, and an annual income after taxes of $194,000. (Figures are from 2019). Instead, an arbitrarily privileged few are extorting and hoarding that wealth, which remains largely unused, uninvested, and stagnant. True Values: Adventure, Anarchy, Balance, Community, ​Compassion, Compromise, Conservation, Cooperation, Courage, Curiosity, Decentralization, Democracy, Diversity, Empiricism, Equality, Faith, Foregiveness, Generocity, Gratitude, Heroism, Honesty, Hope, Humility, Humor, Inclusion, Integrity, Interdependence, Joy, Kindness, Life, Love, Mercy, Moderation, Mutuality, Openness, Optimism, Patience, Peace, Playfulness, Pluralism, Rationality, Responsibility, Sharing, Simplicity, Socialism, Solidarity, Sustainability, Transparency, Truth. False Values: Absolutism, Arrogance, Autocracy, Capitalism, Certitude, Colonialism, Competition, Consumerism, Dehumanization, Dogmatism, Dominance, Duty, Elitism, Empire, ​Excellence, Exclusion, Greed, Hate, Hierarchy, Hoarding, Homophobia, Honor, Idolatry, Independence, Intolerance, Invulnerability, Jingoism, Leadership, Loyalty, Militarism, Misogyny, Nationalism, Obedience, Patriotism, Perfection, Pessimism, Polarization, Pride, Propriety, Punishment, Purity, Racism, Revenge, ​Secrecy, Self-Reliance, Sexism, Superiority, War, Xenophobia.